Same applies for the Common Core. • There’s no money for anything already, where is the money coming from for PD and cost-per-child for testing? • Who wrote these, anyway? “Written by committee,” and they’re continuing to write additions that have not been ratified yet (personal opinion pieces) but they appear to be part of the CCSS. • End points are clear, but the methods of reaching them are not, and these personally-authored pieces are all over the place (but again, treated like part of the CCSS). • The practices of comprehension are so much more complex than they used to be (definition-wise); so is the practice of writing, and the standards reflect that. • Ask for a high level of reading (text complexity), which is refreshing. • Build on each other – you can’t do the later ones without the earlier ones. • Think about whether your students are getting the opportunity to become good at writing these types of text, and what that kind of writing should look like across K–12 and across curriculum. • CCSS asks for institutional buy-in: Everyone agrees on working toward certain levels of ability, and it only works if everyone does it (at all levels and across disciplines) Also, CCSS calls for cross-curricular integration. • CCSS asks for us to “lift the level of teaching and learning” (which is not new in terms of large-scale efforts, and most of those haven’t worked – see NCLB). It’s not just about standards; it’s a call for school reform. So we have to learn from our reform mistakes and not repeat them. • Most people’s reaction will be to read the CCSS and then add new programs and policies and initiatives to meet the core. However, CCSS is not calling for curricular compliance; it’s calling for an acceleration of student achievement (however that is accomplished). The best way to lift the level of achievement is not to add, it’s to see what strong stuff you already have that “gestures toward the common core” and do it more often with more focus and rigor. • You also need school buy-in to the strongest initiatives: A lot of teachers equate professionalism with autonomy, but to the outside world, professionalism is the opposite (relying on a body of knowledge bigger than yourself, and working well with others). • To work in schools, the core needs to be “socially supported” in the school. Motivation is the holy grail of school reform. “Most people, when faced with the choice between ‘change’ or ‘die,’ will choose ‘die.’” The only way to motivate serious change is through the creation of support groups. • The learner needs a clear goal to work toward that is realistic but challenging. • The teacher watches and gives feedback that is supportive (informational, not just praise “This is what you’re doing well”) and critical. • The teacher watches to see if the learner improves; this is the teacher’s feedback. • Kids and teachers both need a clear sense of what it means to “do the work better” and how/where the progress is being made. CCSS lays that out. If you do not know who Skippyjon Jones is, you need to fix that before the holidays! I feel in love with that “rambunctious kitty boy” when he arrived in his first book in 2005. Look at this adorable Skippyjon Jones that Santa brought me! Wouldn’t he be perfect peeking out of a stocking? There is no way a Siamese cat who thinks he is a chihuahua is NOT going to make you laugh. 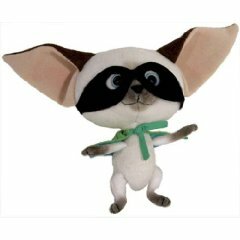 His sisters, Mama June bug Jones, and his gang of Mexican Chihuahuas are also very fun and colorful characters. 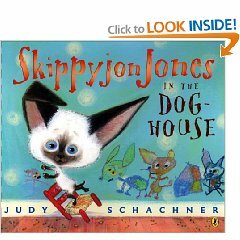 Nonetheless, it did not stop me from buying the newest Skippyjon Jones or laughing at the videos on his new website. Readers of all ages will be amused by his books. A great last minute book choice.